Have you ever heard of Pearl Decor Water Beads? Wonder what the buzz is all about? Let us introduce you to one of the most fascinating decorating accents you’ve ever heard of. Pearl decor water beads are an amazing water absorbent polymer that absorbs, stores, and then releases water and nutrients needed for growing plants. 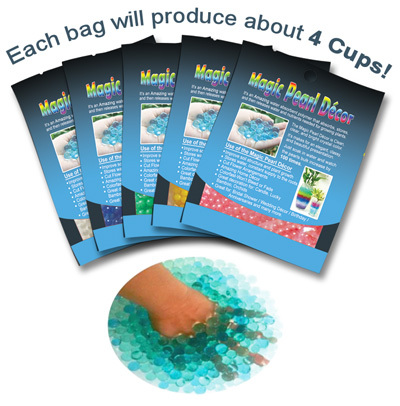 Magic Pearl Decor water beads are a clear, bright crystal color. It makes any beautiful presentation take on an elegant and classy look and feel. Just soak the Magic Beads in water, then watch the pearls increaes in bulk and size by about 100 percent! * Please recycle other packages separately. Order 1 unit – Magic Pearl D’ecor avialable in both retail and wholesale quantities.